One of life’s little pleasures is the all-encompassing Sunday newspaper that contains all the news of the week and, of course the Sunday inserts from Target, Walmart, Best Buy, CVS, Walgreen’s, and this week’s special sales brochure from Shoot Straight which not only advertises the Smith & Wesson M&P 15-T, a tactical semi-automatic rifle with a 30-round detachable magazine for $949 but also the Smith & Wesson 15-22 Rife with a 25 round magazine for $399 for those who want to spend less. That the M&P 15-T is “designed specifically for the needs of military and police around the world” according to Impact Guns, is obviously besides the point. To purchase a rifle in Florida, the only requirement is that you be 18 years old. Fingerprints are not required; nor is a permit, and there is no waiting period. Per Florida statute, the Firearm Purchase Program does conduct a background check of state and national criminal history for the sale of firearms by federally licensed gun dealers, manufacturers and importers only – private sellers are exempt. 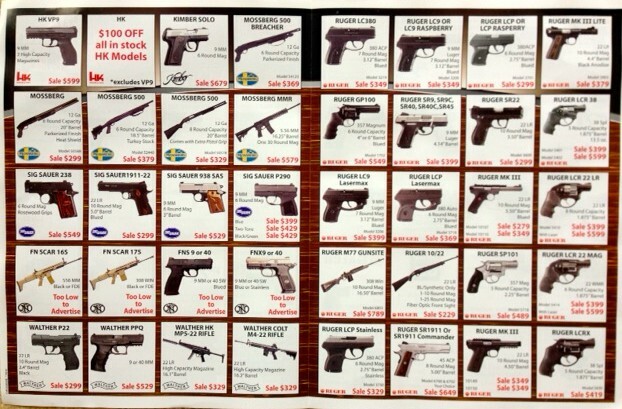 There is also no limit to the amount of firearms that can be purchased per background check. If a person has been convicted of a felony, a misdemeanor crime of domestic violence, or “adjudicated mentally defective” or committed to a mental institution by a court, then he/she cannot obtain a firearm, which is a bit comforting until you start wondering what mentally defective means and realize it’s not entirely clear, as evidenced by Jared Lee Loughner’s ability to “legally” purchase a Glock 19 semiautomatic handgun loaded with a high-capacity magazine six weeks prior to opening fire in Tucson, Arizona, killing five people and injuring more than a dozen others in 2011. Despite being expelled from school for bizarre behavior and recommended for mental health intervention, he did not meet any of the restrictions for purchase and was able to legally buy the Glock 19 although most people would consider Jared Lee Loughner mentally defective. We are in the unique position in this country to determine who is mentally defective after tragedy strikes. 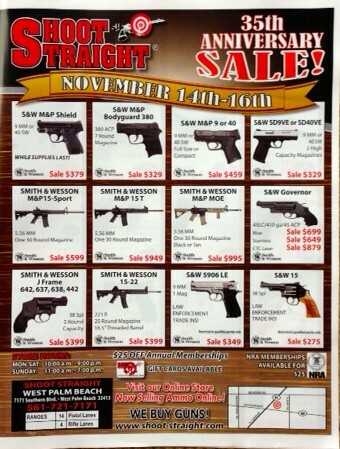 What all this means is that nearly anyone 18 years and older can walk into SHOOT STRAIGHT in West Palm Beach, Florida and purchase a rifle with a high-capacity magazine. But, if you can’t get to the store, the Sunday insert advertises additional services: “Visit our Online Store Now Selling Ammo Online!” They also sell gift cards for that special someone’s stocking stuffer. And to think that Sunday inserts used to be limited to grocery, pharmacy, and retail establishments that generally promote and nourish life…. Will someone please tell me why any person – much less an 18-year old male – needs a rifle with a high-capacity magazine? But, please don’t tell me it’s all about protecting themselves from the tyranny of government because I will tell you that we need to protect ourselves from the tyranny of the NRA and the government who allows these weapons to be sold to the people – primarily young men – who open fire on our children, spouses, family, and friends, on average, every 10 days in this country. And, please don’t tell me the second amendment guarantees the right to bear arms. I know it does but I just don’t believe that the reasons or the circumstances that resulted in the ratification of the second amendment in 1791 are the same as in 2014 or that a person’s right to bear arms trumps a kindergartener’s right to grow up. And, lastly I will tell you that countries that have stricter gun control laws have less deaths by guns. That’s the truth. Fewer guns means fewer deaths, less sorrow, and more life.